LAGUNA HILLS, Calif. (BRAIN) — The latest issue of Bicycle Retailer & Industry News, which is arriving in subscriber mailboxes this week, features a special report on the e-bike. 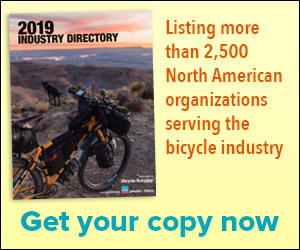 LAGUNA HILLS, Calif. (BRAIN) — The June 1 issue of Bicycle Retailer & Industry News is hitting mailboxes and it includes a special report on executive pay at the industry’s largest public companies. LAGUNA HILLS, Calif. (BRAIN) — You didn't have to walk far at the Sea Otter Classic expo earlier this month to find a European bike brand selling consumer direct in the U.S.
LAGUNA HILLS, Calif. (BRAIN) — The latest issue of Bicycle Retailer & Industry News features a look at how the surging value of the U.S. dollar is affecting prices of bike goods in the U.S. and abroad. ST. PAUL, Minn. (BRAIN) – Construction begins this week at Now Bikes and Fitness in St. Paul, marking the official start of Bicycle Retailer and Industry News' Retail Remodel Project. LAGUNA HILLS, Calif. (BRAIN) — The latest issue of Bicycle Retailer & Industry News features profiles of 41 influential members of the U.S. industry who are age 35 or under. ATLANTA (BRAIN) – Bicycle Retailer & Industry News editors and sponsors hit the road Tuesday for the first Dealer Tour of the year in Atlanta. LAGUNA HILLS, Calif. (BRAIN) — Bicycle Retailer and Industry News is looking for new product information and news to include in its annual Sea Otter Festival & Gear Guide that will be handed out at the four-day festival in April and distributed to retailers and BRAIN's subscriber base before the event. LAGUNA HILLS, Calif. (BRAIN) — Now Bikes and Fitness of St. Paul, Minn., has been chosen as the recipient of BRAIN's Retail Remodel Project. The inaugural project will illustrate the power of retail design and merchandising through the makeover of a bike shop. LAGUNA HILLS, Calif. (BRAIN) — The latest issue of Bicycle Retailer & Industry News features articles about the increased number of motorsports brands entering the bike market, a look at proposed e-bike legislation and the second part of our series on the cycling media — including a look at an alleged “pay-for-play” scandal at a major cycling website.